Enjoys art and good jokes. Can be enjoyed by the bartender. When he reads this poem. 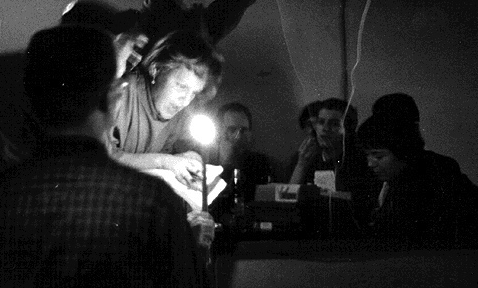 PHOTO: “Blabbermouth Night, an open reading and forum, at The Place” by C.R. Snyder, ALL RIGHTS RESERVED. 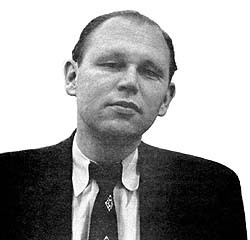 ABOUT THE AUTHOR: Jack Spicer (1925–1965) was a poet often identified with the San Francisco Renaissance — the name given to the emergence of writers and artists in the Bay Area at the end of WWII. In 2009, My Vocabulary Did This to Me: The Collected Poetry of Jack Spicer won the American Book Award for poetry. ABOUT DADA: Dada is a movement that began in Zurich, Switzerland, in 1916 at the Cabaret Voltaire. Its founders struck upon this essentially nonsense word to embody a playful and nihilistic spirit alive among European visual artists and writers during and immediately after World War I. They salvaged a sense of freedom from the cultural and moral instability that followed the war, and embraced both “everything and nothing” in their desire to “sweep, sweep clean,” as Tristan Tzara wrote in his Dadaist Manifesto in 1920. In visual arts, this enterprise took the form of collage and juxtaposition of unrelated objects, as in the work of French artist Marcel Duchamp. T.S. Eliot’s and Ezra Pound’s allusive, often syntactically and imagistically fractured poems of this era reflect a Dadaist influence. Dadaism gave rise to surrealism. (SOURCE: poetryfoundation.org.) To read more about Dadaism, visit wikipedia.org. 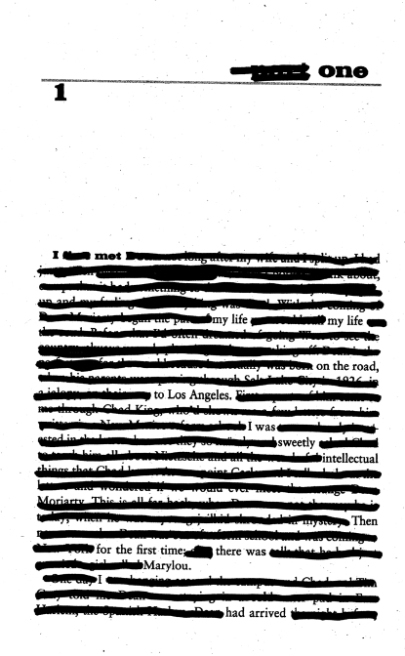 SOURCE: “one 1*” is based on the first page of Chapter 1o in the novel On the Road by Jack Kerouac. ABOUT THE AUTHOR: Thomas R. Thomas was born in Los Angeles and grew up in the San Gabriel Valley west of LA. Currently, he lives in Long Beach, California. For his day job, he is a software QA Analyst. He volunteers for Tebot Bach, a community poetry organization, in Huntington Beach. Thomas has been published in Don’t Blame the Ugly Mug: 10 Years of 2 Idiots Peddling Poetry, Creepy Gnome, Carnival, Pipe Dream, Bank Heavy Press, Conceit Magazine, Electric Windmill & Marco Polo, and the Silver Birch Press Summer Anthology. In November 2012, Carnival released his eChapbook, Scorpio, and Washing Machine Press released a chapbooklette called Tanka. In October 2013, World Parade Books published a book of his poetry, Five Lines. Visit the author’s website at thomasrthomas.org. 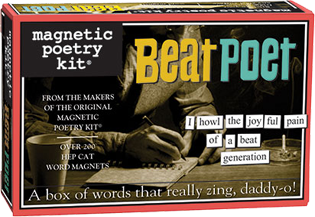 The makers of the original Magnetic Poetry Kit present Beat Poet, a magnetic poetry kit with over 200 hep cat word magnets. This box of words really zings, daddy-o, and celebrates one of America’s best known literary movements. The kit includes words like jazz, generation, road, bohemian, freedom . . . and many more! Find a complete list of words here. Kit contains over 200 themed magnetic word tiles — all for just $11.95. To order, visit magneticpoetry.com. 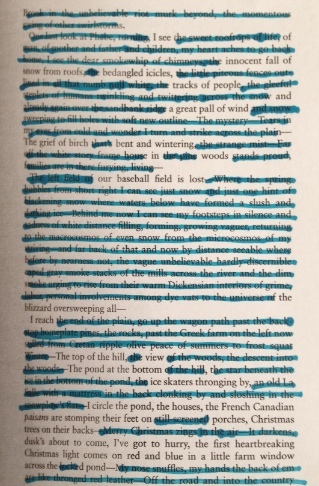 To create a poem online from the original kit, visit this link. If you do, please send a copy to silver@silverbirchpress.com. 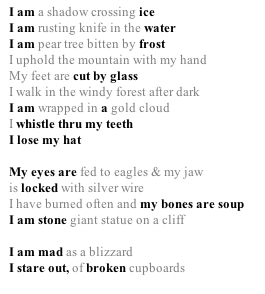 SOURCE: “shadowed” by Alexis Rhone Fancher is based on “I Am a Shadow” by Diane di Prima. George Martin, almost as drunk as a lord, was singing loudest of them all, while the mother sat at the piano playing with a radiant and happy flush on her face. It made Mickey happy, yet also somehow sad to see his mother laughing and playing the piano like that. At Christmas, he always liked to just sit beside her on the couch. She let him have red port wine to drink with the walnuts, and watch the warm soft lights of the tree, red and blue and green, and listen to Scrooge on the radio. He liked to listen to Scrooge every year. He liked to have the house all quiet and Scrooge and Christmas songs on the radio, and everybody opening the Christmas presents after midnight Mass…. They all went in the house. The singing went on around the piano; big Mr. Cariter was doing a crazy dance with his wife’s hat on backwards. It was too much for Mickey who had to sit down in a corner and giggle. For a moment he was worried when the Christmas tree shook a little from side to side, but it had been well secured to the floor—Joe had done the job himself—and he guessed it wouldn’t fall over. He went and threw more tinsel on the branches. Issued by Harcourt Brace in 1950, The Town and the City was Jack Kerouac‘s first published novel. “At Christmas” is based on Jack Kerouac‘s story “Home at Christmas,” found on page 5 of the Beat Collection edited by Barry Miles, available at Amazon.com. ABOUT THE AUTHOR: Barbara Eknoian’s work has appeared in Pearl, Chiron Review, Silver Birch Press anthologies, Re)Verb, New Verse News, and Your Daily Poem. Twice nominated for a Pushcart Prize, her recent releases include her first novel, Chances Are: A Jersey Girl Comes of Age (available at Amazon.com) and her poetry book, Why I Miss New Jersey (Everhart Press, available at Amazon.com). Her new mantra is Carpe Diem. Read “Psychoanalysis: An Elegy” by Jack Spicer in its entirety at poets.org. 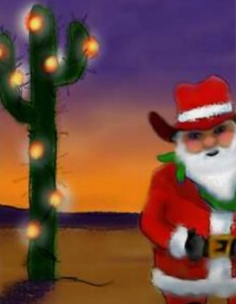 ILLUSTRATION: “Desert Santa” by laylooper. Stickers available at zazzle.com. 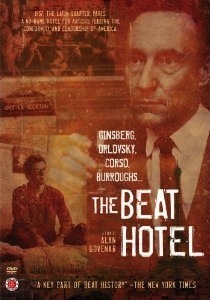 Released in July 2012, The Beat Hotel (directed by Alan Govenar) is an 82-minute documentary that tells the story of a remarkable group of artists — including many of the prominent Beats writers — who in 1957 converged in a cheap Paris hotel, where some of their greatest works were born. Hotel residents included Beat poets Allen Ginsberg and Gregory Corso, along with novelist William Burroughs. Ginsberg began his magnum opus, Kaddish, in the hotel, located in Paris’s Latin Quarter, while Burroughs completed his most renowned work, the experimental novel Naked Lunch. Joining these Americans were artists from a variety of persuasions (photographers, painters, musicians, performance artists) who hailed from France, Britain, and other parts of the world. The Beat Hotel tells the story of the power of art and the power of artists to influence one another in positive ways. Hotel owner Madame Rachou only allowed artists to reside in her establishment — and charged them next to nothing to live there. She felt that artists needed time and space to create — and this was her way of acting as a patron of the arts. A good time was had by all in The Beat Hotel — and this documentary makes you feel as if you were part of it all. Eddie Woods, contributing editor for several Silver Birch Press anthologies, appears in the film — delivering a lively poetry reading outside the hotel. Find the movie at Amazon.com. 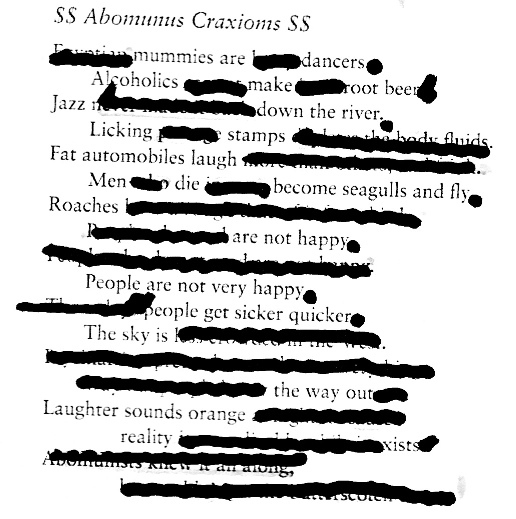 “$$ Abomunus Craxioms $$” is based on the poem of the same name by Bob Kaufman, found on page 306 of The Beat Book: Writings from the Beat Generation. ABOUT THE AUTHOR: Catfish McDaris has been active in the small press world for 250 years. He lives in a cave at a nudist colony. His biggest seller is Prying: with Jack Micheline & Charles Bukowski. His latest book is a hardcover called Jupiter Orgasma from Lulu.com. 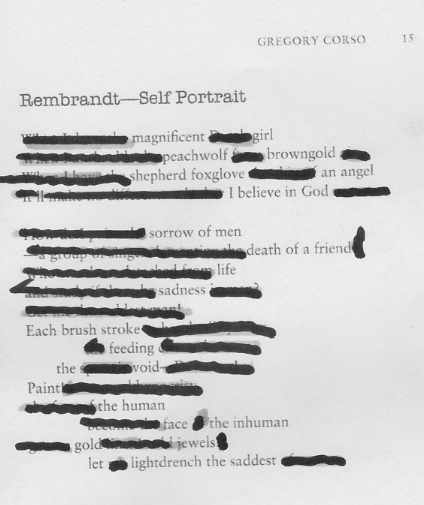 “Rembrandt Self-Portrait” is based on Gregory Corso‘s poem of the same name, found on page 15 of The Beat Book: Writings from the Beat Generation.